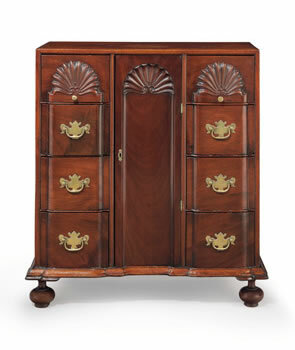 Christie’s New York announces the sale of The John Townsend Chippendale Block-and-Shell Document Cabinet. A rare survival of colonial Newport’s merchant elite, this cabinet is signed by John Townsend, Newport, Rhode Island, 1755-1765 and will lead the sale of Important American Furniture and Folk Art on January 20. The document cabinet is sold with the approval of the directors of the Chipstone Foundation to benefit the acquisitions funds. Diminutive in scale (27 ¾ inches high) but monumental in importance, this extraordinary document cabinet with drawers is a unique form signed by famed cabinetmaker John Townsend (1733-1809) and stands as his earliest known work with a tripartite block-and-shell façade, a design that would become a Newport classic. This document cabinet was long thought to have been dated 1756 and was accordingly revered as the earliest dated piece of block-and-shell furniture with both the convex and concave shaping. While its inscriptions do not include a date, the cabinet may still be the earliest example of a fully developed block-and-shell façade, and as such would represent one of the most significant innovations in early American furniture design. The cabinet is one of only six examples of tripartite block-and-shell furniture signed or labeled by Townsend, four of which are in public collections. With exquisite dovetailing, meticulously planned mahogany drawer linings and carving of the highest caliber, this cabinet exhibits Townsend’s remarkable skills, which he had mastered at a relatively young age. Townsend’s distinctive calligraphic script is seen not only in the two signatures, but also on the backs of the drawers in the lettering running from A through H, which are exceptionally well preserved in graphite. The cabinet is diminutive in scale and may have stood upon a table where in a raised position it would have resembled the upper section of a desk-and-bookcase. A portable form, the cabinet was discovered in a London private collection in the 1950s, sold at Christie’s London in 1955, and subsequently part of the collection of Mr. and Mrs. Stanley Stone, the founders of the Chipstone Foundation.